Angels herald the coming of Christmas and are a special part of decorating for the season. Make this Christmas Angel Garland and start thinking of all the ways you can use it; package decorations, tree decorations, mantel decoration, table centerpiece, etc. It is simple enough that kids of all ages can take part in the activity, that includes Grandma and Grandpa. You can make it bigger or smaller by enlarging or reducing the pattern to fit your need. Paper too is something you can have fun with; tissue paper, card stock, scrapbook paper, or anything you have on hand. If you use something lightweight like tissue paper, print out the pattern on heavy paper and trace on the lighter paper. 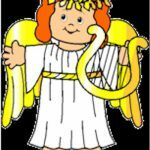 Did you know that angels are mentioned 270 times in the bible? Source Alyssa J. Howard – 15 Interesting Facts About Angels That May Surprise You. Print the star patterned page below and then print the angel pattern on it. It looks best if you print the pattern for the angel on the back of the decorative paper so the cut and fold marks don’t show on the finished garland. Cut on the solid line running down the middle of the page. We made a special page with a band of gold stars running down the middle for you to print, but you can use whatever you have and decorate it afterward if you want to. Fold on the dotted lines and then cut the angels on the solid line. Be careful not to cut on the folds unless you want individual angels to put on a card or package. Each page should give you six angels in garlands of three. It’s easy, it’s fun and you can make lots of them in a little time. how do I print these pages Great Ideas but can’t print can you make a print button? Thank you for bringing this to our attention. There was a recent upgrade in our site software and it seems to have caused a problem. Our IT company has been notified and we hope to have this problem corrected shortly. Please check back. I think we have it fixed now. Let me know if you have any problems.